Does Anyone Know About 'The USA Highway Holocaust' And Can Lessons From The Aviation Industry Help? (San Diego, California, USA): For 117 years (from 1899 to 2016), over 3.7 million people have died on the roads in the United States of America.1 This is why I call it the USA Highway Holocaust. Since 1950 through 2016, in the United States alone, over 32,000 people have died consistently, each year, due to road vehicle accidents. These horrific, tragic and staggering road vehicle death-tolls, is apparently joyfully ignored by the media, almost all U.S. citizens, the government and certainly by our politicians. As far as I know, no one is talking about it. Or not many are talking about this. Not the media, not the general public and not by our politicians. There is simply no excuse for this disgusting and tragic annual death-toll. Yet, when airplane and helicopter crashes occur, the general public, the media and politicians sound very loud warning cries of desperation to ensure there will be better safety measures and controls for aviation in the future.2,3 There is certainly something very wrong with our priorities here in the USA. 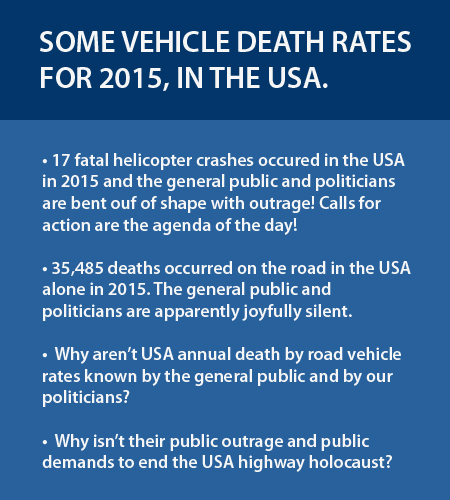 Shouldn't the general public and politicians be shouting loud warning cries due to deaths by road vehicles? Doesn't it make you wonder why people get bent out of shape when there are deaths by airplanes and helicopters but not by land-based vehicle deaths? The entire aviation industry's goal is to have 100% safe flights and this is where the aviation industry can help. If the aviation industry can greatly reduce accidents and deaths due to flying, then the U.S. government can have the same goal of 100% safe travel by road vehicles. What will it take to get politicians and the general public to demand we apply the same strict rules of aviation safety, to road vehicles? It will take community activist meetings demanding that politicians put in laws and policies to stop these needless motor vehicle deaths. But how will the government do this? About 17 years ago, I was a part-time unpaid Equal Rights activist. (Looking back, I almost regret putting in so much unpaid labor time into that, even though it was a good cause, because I really needed to get paid!) However, one of the few things I took away with me, was when a woman activist (now a long-time friend) who said to me, "It all boils down to education." She said, "Racism, sexism, Equal Rights, Human Rights and understanding sexuality, sexual orientation, and gender identity (such as what does transgender mean?) and etc., can be understood by almost anyone, through education." To me, the answer to safety on the road is education. It's obvious to me that we need much better driver's training courses, for all drivers. Non-profit helicopter organizations promote 100% safe helicopter flights, many for-profit helicopter operators have company directives for 100% safe flights and achieve this, all helicopter associations that I know of promote 100% safe helicopter flights and even individual helicopter pilots write articles urging all helicopter pilots to have the goal of 100% safe flights and to never initiate a risky flight due to being fearful of reducing company profits. So the question is, why isn't the U.S. government using the same play book used by the helicopter and aviation industry towards safety on the roads? The answer is this, we could but we don't. At least at this point in time. What we need is to educate our entire nation that safety for individuals on the road is just as critical and as important as safety is for people in the air. 1. Bring back government funded high school drivers education and training. Every high school needs to have classroom driving education classes and must have government funded driver's education cars. 2. Mandatory recurrent training for all drivers. Every 5 years? Every 7 years? The government in conjunction with driver training instructors need to determine this. 3. We need a new mind set for all American drivers. Instead of working against each other while driving, all drivers need to realize that everyone is trying to get to their destination, just as you are trying to do. Wow. What a concept! It's time that all drivers need to learn to be helpful to each other when driving. 4. All drivers need to get off their damn phones. Drivers need to focus 100% of their attention on driving, while driving! 5. We need to address the pseudo-urgency that many drivers have. Remember, speed kills. 6. We need to address super slow and bad drivers. 7. Drivers need to drive responsibly. Turn off the road and park when confused about where you are going. Don't stop in the middle of the road and block traffic while trying to figure out where you need to be going! 8. Drivers need to stop making illegal turns because they want to save time. 9. Always use your turn signals when turning. 10. Be award of your surroundings. Use the quick-glance method to be aware of cars on either side of you and behind you. 11. Pedestrians and drivers both need to be extremely careful around sidewalks. This means that pedestrians must look before crossing. What if a driver gets distracted and runs over a pedestrian? It's because the pedestrian assumed the driver would stop for them. Pedestrians, look before walking and continue to look in both directions while walking on a sidewalk. It takes two to tango. 12. Everyone needs to be super responsible drivers. Why is the aviation so safe? Due to excellent training, recurrent training and pilots being super responsible at flying and taking their job seriously. When you drive a car, think like a helicopter pilot. 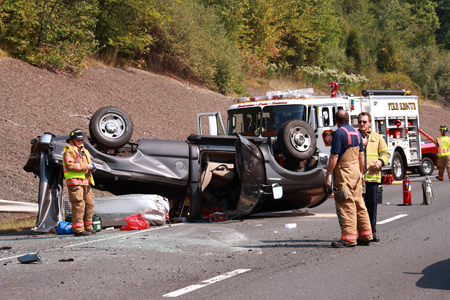 You want to have 100% safe time when driving, take driving seriously and have a zero tolerance for accidents. 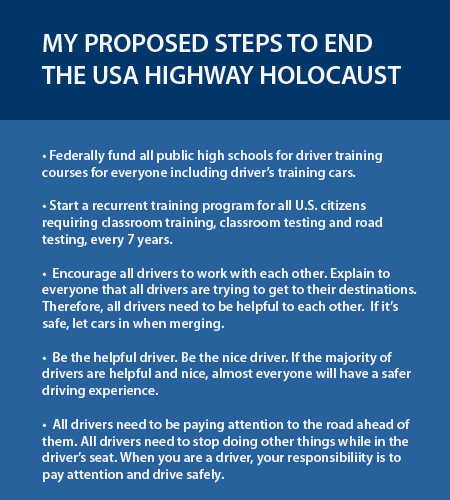 We as a society need to collectively understand that in the USA, we have a highway holocaust because many people and the government is not taking road safety seriously. I recommend that people contact their politicians and force them to take action. In addition to all the tips provided above, remember, you can go online and look up more driving tips on websites and on YouTube. For people to have nice lives5, we have to ensure that proper education, training and good products are made for all drivers. We must keep everyone as safe as possible on our roads and this starts with each of us being good drivers. For those business owners, marketing communications employees and CEOs in the helicopter industry who are interested in advertising with Helicopter Links, pease give me a call +1 (858) 413-7074 or email me at staff@helicopterlinks.com. 3 - "If It Bleeds, It Leads: Understanding Fear-Based Media"
4 - "U.S. Helicopter Accidents Decrease"